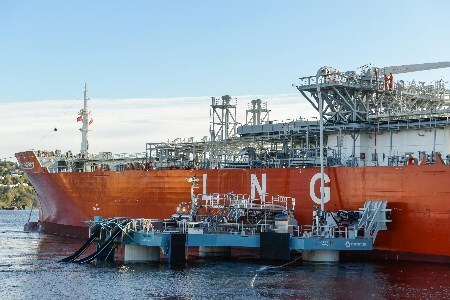 Gas Natural Fenosa and Connect LNG have together made the first ever FLNG ship to shore system a reality. During the successful sea launch of the first full-scale and market-ready Universal Transfer System (UTS) on October the 7th, Gas Natural Fenosa and Connect LNG carried out a complete operation including transfer of LNG from Skangas’ LNG carrier Coral Energy to the onshore LNG terminal at Herøya, in one of the largest and most energy consuming industrial parks in Norway. The design and fabrication of the UTS has involved the highest safety standards, and the complete system has undergone an extensive classification process by DNV GL. The time from finalisation of the detailed design to successful hook-up of the terminal took less than 6 months. The solution has been installed at the Herøya terminal 1 day after arrival from the dockyard, being in full operation the day after, which exemplifies the rapid deployment ability of the solution. The patented Universal Transfer System (UTS) is a game changing floating solution for LNG transfer between ship and shore that replaces the need for cost and environmental intensive harbour and jetty structures. This solution allows for rapid expansion of the value chain and transfer of LNG at locations where it was previously not possible due to environmental and economic constraints. The UTS is a plug&play solution which requires no modifications to the LNG carrier. Gas Natural Fenosa, in collaboration with Connect LNG, is putting in the market a system to enable rapid expansion of the LNG value chain to allow end users to access cheaper and cleaner energy. The UTS is the Direct Link that will enable meeting the rapidly escalating natural gas demand for power generation in emerging markets. “We started an innovation journey and here we are today with a game-changing solution that is revolutionary for the LNG industry. From now on, we have a market-ready system that opens a world of possibilities in the LNG small scale business”, commented a Managing Director of Gas Natural Fenosa. “With Connect LNG’s disruptive technology and agile company culture, combined with Gas Natural Fenosa’s long and strong track record in the energy market, there was an obvious foundation for collaboration and leveraging both companies’ strengths as a basis for enabling access to natural gas where today it is not economically viable”, declared an Executive Director of Connect LNG.